Providing instantaneous technical and sales support to their customers. Offering LiveChat to communicate with customers on their website. Customers are happy with LiveChat, which now accounts for almost 50% of all customer interactions. 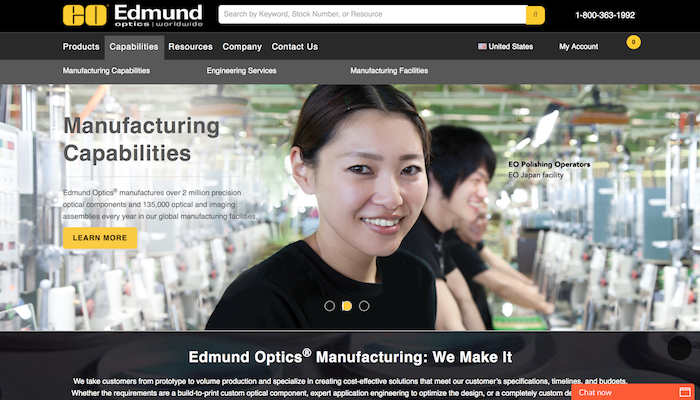 Edmund Optics® handles almost 50% of customer interactions through LiveChat Edmund Optics® has been a leading supplier of precision optics and optical components since 1942. 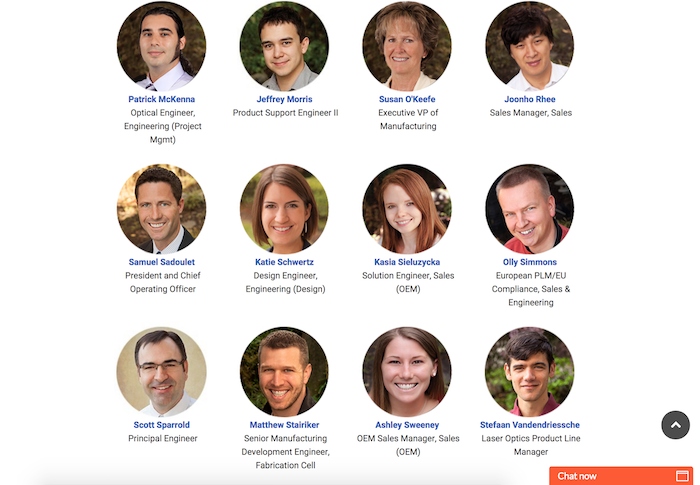 They design and manufacture a wide array of multi-element optical lenses, lens coating, imaging systems, and optomechanical equipment. Edmund Optics® continually pursues new ways to implement optical technology, enables advancements in industrial metrology, life sciences, and more. This worldwide company has grown beyond their corporate headquarters in Barrington, New Jersey, USA, with multiple sales office and manufacturing locations located around the globe. Why were they looking for a chat service? The ability to provide technical and sales support to their customers instantaneously for those products has proven to be a huge selling point for their customers. Before LiveChat, the company tried a few different chat services, but as Greg said: “LiveChat represented the right combination of features to price point.” Edmund Optics® supports customers through LiveChat in offices around the globe. In the US, around 20 technical support engineers are available to assist customers, with 3-5 logged in at any given time. One of their favorite features is chat tags, which in turn gives them access to a lot of customer data. By adding a tag to the chat, they are able to look up statistics for a particular type of case. They created tags such as “post-sales,” “product lookup,” “info request,” “optical lenses,” and many more. Gathering information like this has a lot of benefits, such as creating an FAQ with the most common questions customers asked based on these tags. Edmund Optics® also uses chat transcripts so that both customers and technical support engineers can send the whole conversation to a specified email address for future reference. Another feature they like to use is a post-chat survey, which allows them to gather detailed feedback after each chat. Customers can rate their experience based on the chat, and also leave a detailed comment or ask specific questions about the service they received. By knowing what customers liked and did not like, helps improve their service. Edmund Optics® began using LiveChat in 2011 and has seen a drastic increase in the number of chat-based interactions since then. In 2011 chat volume comprised of 11% of the total number of interactions with customers. In 2017, chats made up 42% of all customer interactions – easily surpassing emails and phone calls as their customers’ preferred method of interaction. We’ve been very happy with LiveChat. It allows us to connect with customers while they are browsing our website: both pre- and post-sale. There have been many occasions where customers have shared their appreciation for the service we offered. Customers appreciate LiveChat as an additional channel of communication. There are a lot of people who would rather write instead of call so having the option for virtual, prompt response allows many to not pick up a phone. Additionally, while browsing your website, customers may not have an exact question at that moment. If you start talking with them casually, encouraging them to chat, you can help them choose the right product and make a difference in their buying decision – and that is what customers will appreciate. With reviews like the ones above, Edmund Optics® plans to keep providing LiveChat to their customers and deliver the best service possible. LiveChat helps to take away any customer doubts if they have any. Generating more car rentals through swift live chat customer service.